There will be no attempt to cover the background, speeches or implications of this event. Rather, the interest here is on some aspects of media coverage. Here are the basic facts, which are not in dispute. Over 50 leading Taiwan business leaders are attending a two-day trade seminar in Beijing jointly sponsored by the Kuomintang (KMT) and Chinese Communist Party (CCP), with top financial and technology companies represented. The forum, which opened yesterday, saw former opposition leader Lien Chan and top Chinese Communist official Jia Qinglin in attendance. Some of the forum's other attendees read like a page from "Who's Who in the Republic of China". Attendees representing financial industries include Fubon Financial chairman Daniel Tsai and chairman and CEO of Chinatrust Financial Holdings Co. Jeffrey Koo. Representing technology companies are Hon Hai Precision Industry Co. chairman Terry Gou, Advanced Semiconductor Engineering Inc top official Jason Chang and Powererchip Semiconductor Corp. chairman Frank Huang. There's also Foxlink chairman T.C. Gou, Evergreen Group Vice President Chang Kuo-cheng, Taiwan Cement chairman Corporation President Koo Cheng-yun, Yulon chairman Kenneth Yen, Ruentex Group chairman Yin Yen-liang and Core Pacific Group chairman Shen Ching-jing. But a lot of other things are being disputed. This begins with the name of the event. What is it? 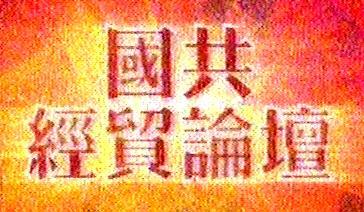 The Cross-Straits Economic and Trade Forum, or the KMT-CCP Economic and Trade Forum? Speaking for mainland Chinese government, this event should be elevated as the Cross-Straits Economic and Trade Forum. Speaking for the Taiwan government, this event should be reduced to a meeting between the Kuomintang and Chinese Communist Party. So can you guess which titles were used by ... ? The next bit is about the Taiwan business people in attendance at the forum. A group of fifty came on the chartered flight from Taiwan, but many of the local Taiwan business associations around China also sent their officers. The following are two diametrically opposite stories, which cannot be both true. (Taipei Times) Beijing turns the screws for forum. By Jewel Huang and Shih Hsiu-chuan. April 11, 2006. China is forcing Taiwanese businesspeople to attend an economic summit between the Chinese Nationalist Party (KMT) and the Chinese Communist Party (CCP), a top Mainland Affairs Council official said yesterday. Council Chairman Joseph Wu (吳釗燮) confirmed yesterday that Taiwanese businesspeople are being pressured to attend a two-day forum on cross-strait trade to be held by the Chinese Communist Party (CCP) and the Chinese Nationalist Party (KMT) that opens on Friday. Wu urged the KMT not to touch on issues that involve governmental authority. The Chinese-language Liberty Times (the Taipei Times' sister newspaper) reported yesterday that the Taiwan Affairs Office (TAO) of China's State Council had issued an order to the heads of more than 80 Taiwanese business associations in China to attend the forum. The office warned that failure to comply would result in stiff penalties, the report said. The office has also ordered Taiwanese businesses nationwide to mobilize in Xiamen and Shanghai to greet former KMT chairman Lien Chan (連戰) when he tours those cities before heading to Beijing for the forum, the report said. The Liberty Times report said that many of the associations are angry that they are being coerced to participate in what they called a meaningless event. Wu said the Mainland Affairs Council has verified that official letters were sent to the heads of Taiwanese associations requesting they attend the forum. "We disapprove of China's actions, which greatly bothers Taiwan's businesspeople," Wu said. When Chinese President Hu Jintao (胡錦濤) met with Lien last year, Chinese officials only demanded that Taiwanese businesspeople in Shanghai show up to support Lien's visit. According to the Liberty Times story, Hu then hosted a banquet for more than 100 Taiwanese businesspeople, but made a quick exit along with other top Chinese officials, leaving his "guests" to foot the bill. Wu also warned the KMT yesterday that the Mainland Affairs Council will not recognize any conclusions reached at forum on issues that involve government authority such as cross-strait charter flights. "Taiwanese officials' participation cannot be ruled out for any negotiations that require governmental authority. Otherwise they [such negotiations] would be illegal and ineffective," Wu said. He said China is using a "carrot and stick" strategy, only it was just paying "lip service" instead of carrots. Most of its promises or goodwill attempts are "not true," he said. "But the 'stick part' that China is implementing could not be more genuine," he said. "Its suppression of Taiwan's diplomatic space and its military build-up never stop." Wu said that Beijing continues to take advantage of the confrontation between Taiwan's ruling and opposition parties and manipulates the conflicts in order to divide this country and besmirch its sovereignty. "Coupling military threats and sweeteners is China's new strategy for dealing with Taiwan," Wu said. "Were you forced to come here as well?" This sentence was the open question when the various local Taiwan business association presidents were greeted at the Beijing capital airport. When this sentence is uttered, it is accompanied by laughter from everyone. According to Economic Daily News, prior to the KMT-CCP forum began, the Mainland Affairs Council made the exclusive "revelation" about the "ugliness" of how mainland China was forcing the local Taiwan business association presidents to attend. This has become the subject of jokes among the Taiwan business people when they chatted. "If I did not come, how will I be punished afterwards?" said Zhangzhou Taiwan Business Association president He Xihao. "How can this be? What kind of joke is this?" Beijing Taiwan Business Association vice-president Li Ming said that the number of slots at the forum is limited while the response has been great. No less than ten Taiwan business persons has asked him for assistance to obtain an admission ticket. Li Ming said that the Taiwan business people are very practical. They are inclined to think that the Kuomintang will regain political power in 2008, and so they obvious want to the on good terms with the future ruling party. He Xihao said that the Taiwan government might have thought that the Taiwan business people were being forced to attend because they might have seen words such as "No leave allowed" on the forum invitation. He said that these words often appear in the notices to important meetings. But if they don't come, can they be punished? The Mainland Affairs Council must be kidding. CCTV 9 has it both ways.